Homeless and addicted: On the street or off? Jason Renaud was trying to help a longtime street addict who said he was finally willing to do what it takes to stop being homeless. Formerly homeless David Lyman peeks out from his Biltmore Apartments studio in Old Town at crack dealers on the street below. Lyman says he's an alcoholic, and a regular user of sleeping pills and anti-depressants. These publicly subsidized apartments allow drinking. Some advocates say recovery housing, where drinking is not allowed, would be a better place for many homeless. For the first time in 20 years, the man sobered up and secured an appointment for outpatient drug treatment. But along with that, Renaud says, the man needed a place to live in a public housing building not dominated by others using drugs and alcohol. The man was told he would have to wait a year. Renaud’s friend is back on the street and using drugs, and Renaud — for years one of Portland’s most outspoken advocates on behalf of Portlanders suffering mental illness and addiction — says he has given up on Portland’s public housing policy as a way to help the mentally ill and addicted. Renaud is one of a number of people working with the homeless and the addicted in Portland who are concerned that the city and federal governments’ commitments to “Housing First” — with its philosophy of first getting chronically homeless people off the street — has allowed the pendulum to swing too far in favor of housing unconditionally. Their frustration has surfaced because of the imminent opening of the Bud Clark Commons, the city’s newest and most expensive homeless housing project, which features 130 apartments in a $47 million LEED-certified building. The tenants for the commons are selected because they are the most vulnerable of Portland’s chronically homeless. Nearly all of them have addictions and mental health problems — and will be allowed to stay in their apartments for as long as they abide by the building’s rules of behavior. The commons is what often is called a “wet” building, based on the Housing First model adopted by the Portland Housing Bureau, and promoted nationally by the federal Department of Housing and Urban Development. The commons pushes the idea of wet housing to a degree that is unique to Portland, but exists in other cities. In St. Paul, Minn., a wet housing project houses 60 previously homeless alcoholics at $18,000 a year per person, with the understanding that few will ever recover. Drinking on the building’s back patio — rather than alone in rooms — is tacitly encouraged. Seattle has eight wet public housing buildings for its most vulnerable homeless. At the Bud Clark Commons, drinking will be allowed. Illegal drug use will be tolerated to an extent, but not in communal areas of the building. If it weren’t, many of the new tenants, who have addiction problems, would soon wind up back on the street, according to housing advocates. 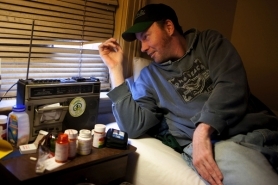 John Blair sits alone in his $3 a month Butte apartment in Old Town. Blair, homeless for years, says he had to wait four years to get into his publicly-subsidized unit. Discussions about what type of public housing to build are all set in relief against a disturbing backdrop: There simply isn’t enough to go around. Seven years into Portland’s 10-year plan to end homelessness, the city has more homeless people than before the plan was adopted. That isn’t because of any lack of effort to address the problem. So if there’s only going to be enough public housing for a fraction of those who need it, the questions become: What type of housing should we support, and who should get priority? For nearly a decade, the concept of Housing First has dominated the conversation when it comes to housing the homeless. Sometimes it is called “low barrier housing,” because it comes without conditions about whether, for example, alcoholic tenants can continue to drink. Others refer to it as “harm reduction housing” because getting the chronically homeless off the street at least lessens the harm they cause while on the street — both to themselves and to taxpayers. Public expenses related to the chronically homeless can be extraordinary because of the crimes they commit and their unpaid visits to hospital emergency departments and overnight shelters. Ed Blackburn, executive director of nonprofit Central City Concern, which provides a wide range of social services to the homeless, says that in the past few years almost all of the taxpayer money spent on public housing has gone toward Housing First buildings. “I’m not against this kind of housing, but what we’re really lacking now is capacity for people who want to enter recovery and significantly change their lives,” Blackburn says. Both homeless and addiction policy advocates recognize the need for both types of housing, wet and dry. They also know that the terms wet and dry housing are oversimplifications because there are many variations. For instance, transitional wet buildings that lead to permanent dry apartments, or dry buildings that forgive relapse. Housing advocates tend to favor the Housing First, harm-reduction model. The cost of leaving on the street those 130 tenants soon to be living in Bud Clark Commons would be enormous, in some cases close to $1 million in taxpayer money during just one of those individual’s lives. “It does no good to evict them and put them back on the street; then it’s a problem for everybody,” says Bobby Weinstock, housing consultant with Northwest Pilot Project, a Portland nonprofit that helps seniors confronting homelessness. Two men (who asked not to be named) drink beer on the bank of Interstate 5 in Northeast Portland and discuss what they say is a need for wet housing for those unable to give up their addictions. Both men, chronically homeless, say they don't qualify for most affordable housing because of prior criminal convictions. Mental health and addiction treatment providers say harm reduction looks at the big picture, but fails to look at what’s best for the individual homeless person. On a daily basis, Eric Bauer sees as many homeless, addicted people as anybody in Portland as executive director of the Portland Rescue Mission in Old Town. Bauer says wet housing is necessary and humane for what he estimates might be 30 percent of the homeless. Those include the homeless with severe mental illness, chronic diseases and people older than 60. The rest, Bauer says, have a better chance at recovery if they are in buildings where they have to try, and can’t be seduced by buildings where they don’t have to. Bauer says that the idea of Housing First has changed from when it was first proposed locally, when the idea of harm reduction prevailed. “When this first came out, it was the 10-year plan to end chronic homelessness and every city had a few guys or gals who were million-dollar guys. The argument was a solid argument for the million-dollar wonders but they aren’t the norm,” Bauer says. Bill Russell, another member of the faith-based recovery community as executive director of the Old Town Union Gospel Mission, says placing addicts in a building where drinking is allowed doesn’t make sense. The Mission’s LifeChange program houses and helps recovering addicts, most who start out homeless, and demands complete abstinence from drugs and alcohol. Russell says that most homeless addicts have plenty of examples in their pasts of housing and jobs that they’ve left. “To say, you get stability back by giving them housing and employment, we kind of head scratch on that by saying, well, we’ve given them housing and employment,” Russell says. Housing First advocates, however, turn that argument around. For those who have tried recovery and failed, they say, wet housing is the more compassionate last hope. “If you extend the logic of the arguments around enabling (advanced by those who) are opposed to harm-reduction approaches, essentially they say that these people should remain homeless for their own good. And I fundamentally reject that,” says Daniel Malone, director of housing programs for Seattle’s Downtown Emergency Service Center. The Service Center runs eight wet buildings. Central City Concern’s Blackburn says that for the majority of homeless, dry housing works better. Central City Concern runs a variety of housing types, wet, dry, permanent and transitional housing. One of the advantages of dry, he says, is peer pressure. Central City Concern’s recovery buildings require tenants to sign a covenant in which they promise to abstain and support other tenants in their abstinence. On the other hand, Blackburn says, if the goal is simply keeping people off the street, studies show that once in wet buildings, previously homeless tenants tend to stay longer. In recovery buildings, he says, more tenants put their lives together and move on. Blackburn says he wonders what will happen to tenants in the Bud Clark Commons who decide they want to embrace recovery, but can’t do it in a building dominated by those still drinking and using. If they leave the commons, they could be homeless for a year waiting for an opening in a dry building, he says. What most concerns Blackburn and others is that finding the right mix of wet housing vs. dry housing doesn’t appear to be part of the policy discussions. Nationally and locally, he says, there are two entrenched camps and very little give and take. Housing First has prevailed. Housing First or strings attached? Housing First means exactly what it says – provide housing unconditionally as the foundation for stabilizing the lives of the homeless, and then offer services such as drug and alcohol treatment to clients better able to embrace the change. In addition, Housing First advocates say restrictions on alcohol use in an apartment – even one funded by taxpayers – would be unjust, since alcohol is a legal substance. The argument against setting conditions comes from John Song, a University of Minnesota physician who studies end of life issues with the homeless. People who say public housing for addicts and alcoholics should come with strings attached don’t truly believe addiction is a disease, Song says. “Alcoholism should be looked at more like cancer,” Song says, pointing out that few would take away public housing from a cancer sufferer who refused to get chemotherapy. Still, there are precedents for attaching strings to public money for homeless people and addicts. Oregon’s Temporary Assistance to Needy Families program is guided by rules that can require recipients who are substance abusers to enter recovery programs to keep their benefits. The U.S. Veterans Administration provides housing vouchers for homeless veterans, but those are also conditional. Substance-abusing vets are required to work with case managers on their problems to receive their vouchers. Closer to home, the Portland Police Bureau’s Service Coordination Team works to get the city’s most frequently arrested citizens – most of whom are homeless and addicted – off the streets. The bureau’s team has access to recovery programs and immediate housing that make it the envy of most social service agencies. There are strings attached when the service coordination team offers housing. Clients get about a month grace period in free wet housing, where drinking is allowed, and then they have to cooperate with a treatment plan if they want to keep the housing and graduate to more permanent “dry” apartments, according to Program Manager Austin Raglione. It makes sense for her clients to require conditions on some housing, Raglione says.